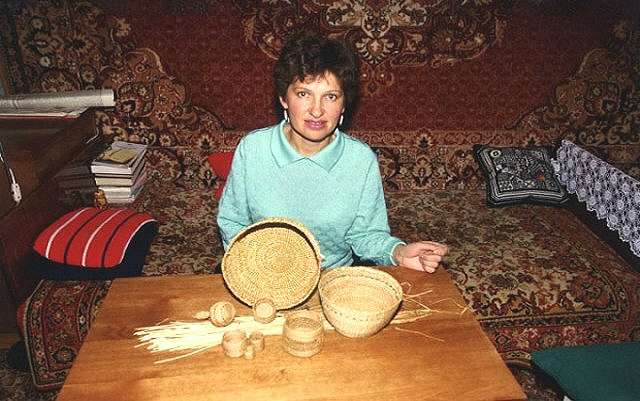 Nina Kiyaykina and Aleut Traditional Grass Basket Weaving. Nina Kiyaykina was born and raised in Nikolskoye, Bering Island, Russia. Nina began traditional-style Aleut wet grass basket weaving in 1991 on her island. She is self-taught. In the late 1980's, the late Russian ethnologist Dr. Roza Liapunoza, specializing in Aleut native culture, worked for years with the Aleut people of Bering island where she met Nina. Aleut baskets had not been done on these islands for nearly one hundred years. Aleuts had been relocated from the Aleutian chain in the late 1700's to harvest seals for the Russians on the Commander islands. With the revolution in Russia, changes affected the culture of the Aleuts and they gradually ceased their basket weaving and the techniques were forgotten. Dr. Liapunova asked Nina if she would like to learn the art of traditional Aleut grass basket weaving. Nina replied she was not interested. Six months later she reconsidered and said, why not? From the ethnology museum at the Academy of Sciences in St. Petersburg, Dr. Liapunova sent Nina some diagrams of the techniques and from these Nina began learning an ancient Aleut tradition. One critical part was missing in the documentation she received. How does one prepare the grasses for weaving? Traditionally baskets are made of short, fine rye beach grass (Elymus mollis) that is found only on a few of the islands of the Aleutians and grows on the dunes or hillsides away from the salt water of the ocean. Grasses are gathered in July or August and require procedures that keep the grasses moist until it bleaches to a pale tan. It must be turned often to prevent mildew then washed and dried. Nina experimented on her own until she found the right procedure for the desired outcome. It takes three to six months to complete a basket working three to four hours a day. Aleut grass baskets are among the finest in the world of basketry. Traditional technique is tightly woven and as fine as linen. The only tool used is a sharp fingernail to continually split a blade of grass into finer and finer strips until nearly as thin a thread of linen. During the weaving the grass is dampened. Today there are only three or four traditional Aleut grass basket weavers in the world. Nina is one of them. Her baskets are in the collections of the Anchorage Historical Museum, Alaska. Nina came to Canada on the invitation of Susanne Swibold and Helen Corbett who worked with the Aleuts on the Commander islands for four years. Through their Canmore, Alberta based Amiq Institute, Nina received a scholarship to the Smithsonian Institute as a native American specializing in traditional Aleut basket weaving. The Glenbow Museum and the Chicago Field Museum invited Nina to view their basket collections and share her expertise. Nina was a featured basket weaver at the international weavers conference in Naramata, B.C. in the late 90's. For a look at Nina's island, her people and wildlife, see the AMIQ Institute website www.amiq.org. Copyright © 2006 by Nina Kiyaykina. All rights reserved.